Mirror photo by Gary M. Baranec Everett pitcher Jacie Martin bumps gloves with first baseman Brittany Ewing in the second. EVERETT — In the top of the third of the Everett-Chestnut Ridge playoff game, Ridge’s Attie Milliron crushed one into the left-center gap. Brooke Colledge streaked after it and made the catch, smashing her face off the fence in the process. With Colledge writhing in pain on the ground, right fielder Shelby Schleinkofer grabbed the ball out of Colledge’s glove and threw it in for a double play to end the inning. After a few minutes, Colledge got up, clutching her face. The junior center fielder had a split lip and cracked tooth. Not once did she think about coming out the game, though. Colledge not only stayed in the game but provided the big blow in a six-run bottom of the sixth to help the Lady Warriors down Ridge, 11-5, in the District 5-8-9 3A semifinals. After Ridge fought back from a 5-1 deficit to tie the game with a four-run fifth, Everett took the lead in the bottom of the sixth when Kristen Ewing scored from third on a wild pitch. Colledge followed with a two-run homer to put Everett up 8-5. The Lady Warriors tacked on three more to seal the win. Alex Iseminger and Jacie Martin both doubled. Ewing and Sydney Reffner closed out the rally with RBI singles. Everett jumped out to an early 5-1 lead with single runs in the first, second and third and two more in the fourth. Brittany Ewing knocked in three of the runs with a sac fly in the first, a fielder’s choice in the second and a triple in the fourth. Ridge rallied in the fifth. After Martin struck out the first two batters, five straight batters reached base and four of them scored. After Makayla Weyant doubled, Kayla Diehl tripled her home. Everett then intentionally walked Milliron, and Lydia Mock reached on an error that scored Diehl. Sam Baney singled in Katie Gibbner, who was running for Milliron. Mock scored on a passed ball to tie the game, 5-5. 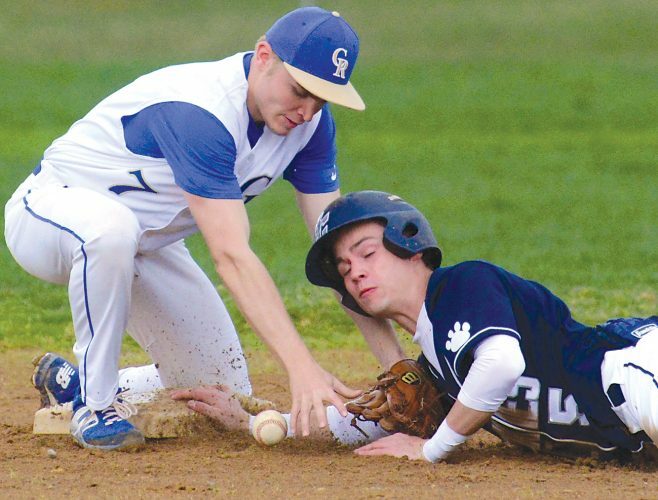 Reffner and Iseminger each had two hits and two runs scored. Kristen Ewing had two hits as well. Brittany Ewing scored two runs to go along with her three RBIs. Colledge also had three RBIs. Payton Whysong homered for Ridge, and Weyant went 2-for-4 with a run scored. 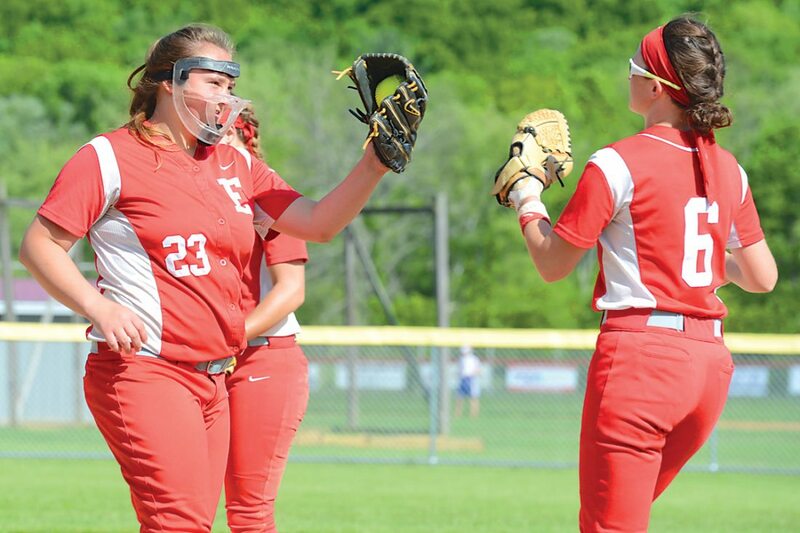 Everett advanced to next Wednesday’s championship game in DuBois against Karns City. The winner advances to the state playoffs. Ridge’s season ended at 14-4. CHESTNUT RIDGE (5): Whysong cf 411, Weyant ss 412, Diehl 1b-p 211, Milliron p-1b 301, Gibbner cr 010, Mock lf 310, Baney 2b 301, Dunlap 3b 201, Emerick rf 300, Oldham c 300. Totals — 27 5 7. EVERETT (11): Reffner ss 322, B. Ewing 1b 321, Colledge cf 411, Iseminger c 422, Price 3b 301, Martin p 411, Schleinkofer rf 311, Grubb lf 210, K. Ewing 2b 412. Totals — 30 11 11. E–Weyant 2, Reffner. 2B–Weyant, Iseminger, Martin. 3B–Diehl, B. Ewing. HR–Whysong, Colledge. RBI–Whysong, Diehl, Baney, B. Ewing 3, Schleinkofer, Colledge 3, Martin, K. Ewing, Reffner. WP–Martin. LP–Diehl. SO–Martin 4. BB–Milliron 4, Diehl 3, Martin 4. Records: Chestnut Ridge (14-4); Everett (15-2).